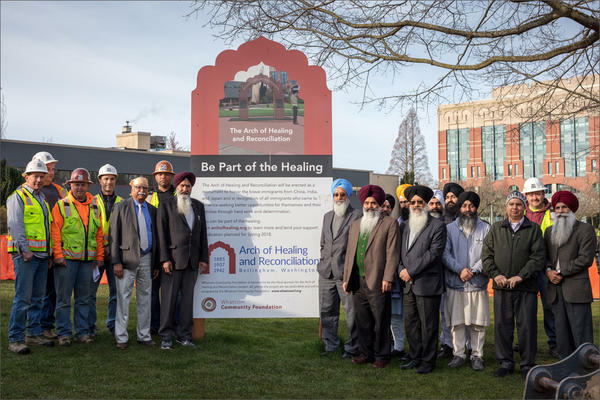 In late winter, organizers blessed the site of the Arch of Healing and Reconciliation before contractors poured the pad. Contractors installed the solid granite arch on Wednesday. 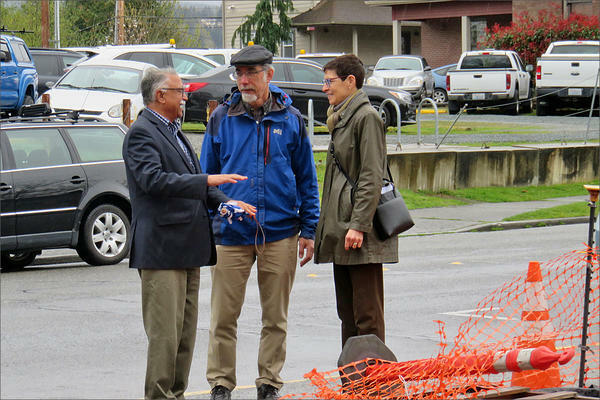 Paul Englesberg and Mauri Ingram joined Satpal Sidhu, left, at the arch construction site on Monday. Pat Kawabata, pictured here at age six awaiting transport from Bellingham to a World War II internment camp, is returning to attend the installation of the arch. 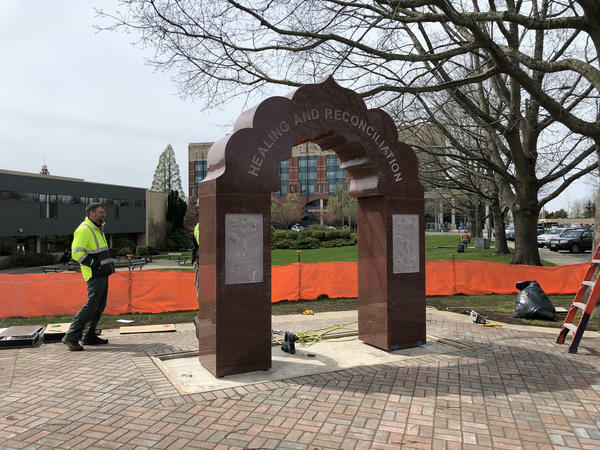 Bellingham, Washington, dedicates a new monument this Saturday that speaks to the Pacific Northwest's long and conflicted history with immigration. The "Arch of Healing and Reconciliation" memorializes the past expulsions of immigrant Sikhs, Japanese and Chinese. The arch joins a growing group of similar local monuments including the Garden of Surging Waves in Astoria, the Japanese internment memorial on Bainbridge Island, Tacoma's Chinese Reconciliation Park, and a planned memorial garden at the site of the former Chinese burial ground at Lone Fir Cemetery in Portland. The Bellingham arch grew out of the rediscovery of a nearly forgotten riot. Local historian Paul Englesberg was researching the Asian immigrant experience in the Northwest when he came across a reference to an ethnic riot a century ago in his own community. "People in Bellingham don't know about it," said Englesberg, who is on the faculty of Walden University. 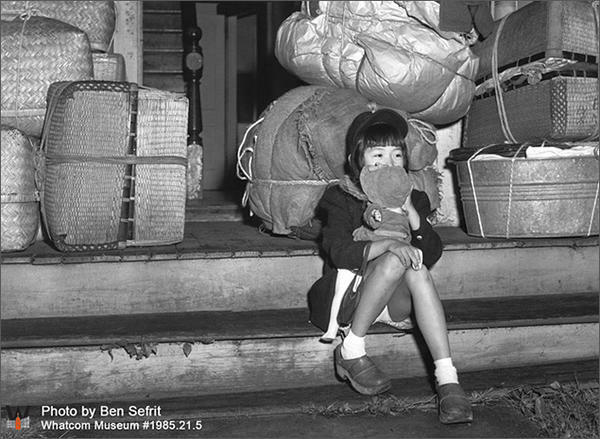 "But people who study Asian-American history, they've heard about this because it was the largest atrocity committed in the United States to immigrants from India." It happened in 1907, a year after migrant workers from India, most of them Sikhs from the Punjab region, began crossing the border from Canada to take jobs in Washington state. "Bellingham lumber mills—there were dozens of them—and shingle mills, they were hiring anybody who would come in and work,” Englesberg said. Englesberg said an upwelling of anti-immigrant rhetoric provoked a mob of white workers to attack the Punjabis. One newspaper had labeled the recent arrivals as "a dusky peril." "Workers were worried that these non-white workers were taking away their jobs,” Englesberg said. “The idea in the speeches and the papers was these people from India would work for less." No one was killed in the rampage, but all the Punjabi men fled, never to return. Some of the estimated 200 to 300 went back to Canada and a bunch migrated south through Oregon to California, where descendants can be found today in the Sacramento Valley. "I had some inkling from my father-in-law who lives up in Abbotsford (British Columbia),” chairman of the Arch committee Satpal Sidhu said. “He never told us the story, but he always advised us when I was very fresh from India, 'Don't stay overnight in Bellingham.'" Sidhu began to defy that warning more than 30 years ago. He eventually became dean of engineering at Bellingham Technical College and is now a Whatcom County Council member. Something else Sidhu remembers is a 2007 gathering at the Sikh temple in Lynden, Washington, to mark the 100th anniversary of the anti-Indian riot. "We promised all the audience at that time that we would like to create a memorial for this,” he said. "We don't know what, but we will. And we never gave up on this idea." The memorial’s construction site is in the corner of a small park between the Bellingham Public Library and City Hall. This is where a pointed arch made out of solid red granite imported from India rises from a base of granite tiles inscribed with the word "Welcome" in many languages—starting with "Welcome" in the language of the Lummi and Nooksack tribes. "The total after the structure is done, it'll be 12 feet high and 12 feet wide,” Sidhu said. "It will totally stand out." Sidhu said the arch design carries symbolic significance. "The philosophy says the doorway is a new perspective,” he said. “When you walk through a doorway you leave something behind, you walk into something new." As the plan for the arch developed, a committee decided the arch would also commemorate the 1885 banishment of Chinese workers and the 1942 wartime internment of Japanese-Americans. Mauri Ingram is president of the Whatcom Community Foundation. It helped sponsor the project as part of a broader goal to increase neighborliness. "We all know memorials are important. And yet, it's never been envisioned as exclusively a way to mark this series of tragic events,” Ingram said. “It's always been with an invitation to the whole community to say how can we get to know each other better." The committee continues to raise money even though the Arch of Healing and Reconciliation is paid for. The add-on goals include a traveling exhibit, an annual ethnic food festival and a scholarship fund to help children of first generation immigrants afford college. "What I'm elated about in our community is that the effort has continued to grow at this fundamental core level that says, 'Why not? Why not another group? Why not another idea,'" Ingram said in an interview Monday. A $50,000 pledge from the Sikh temple kicked off the fundraising for the arch last year. 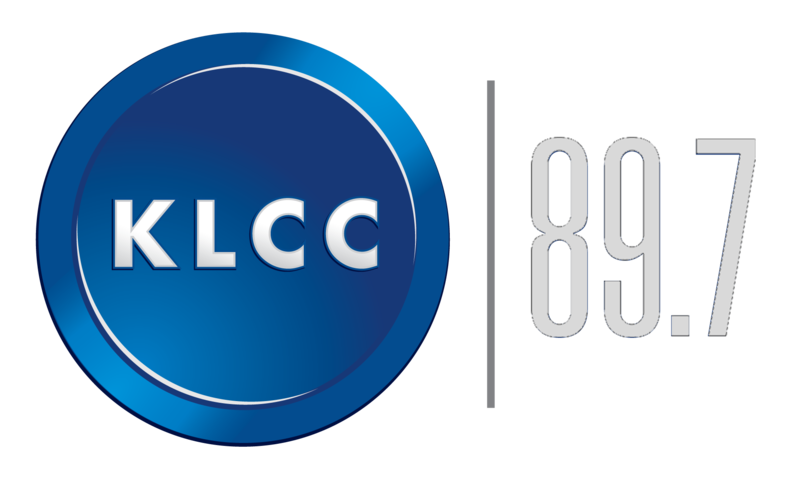 The community foundation chipped in $25,000. The financial goals are now set much higher, including a roughly $1 million endowment for scholarships. Where: 210 Lottie Street, Bellingham, Washington.